Army cadet Dion Hart photographed in Crandall Pool at the United States Military Academy in West Point, NY on Monday, November 24, 2014. Hart, 22, of Phoenix, AZ, is a senior on the Army swim team who was born to a 14-year-old mother and endured every possible hardship, including surviving homelessness, living in crack houses, and spending most of his life on welfare and food stamps. © Chet Gordon for New York Daily News. On Monday I had the honor and pleasure of meeting and photographing a fine young man and Army cadet Dion Hart of Phoenix, AZ at the United States Military Academy in West Point, NY. It was all familiar territory as I’d covered USMA for nearly eight years while on staff at my previous staff job at the Times Herald-Record in Middletown, NY. That time included numerous Div. I sporting events, including full seasons of Army Football and Basketball, Presidential visits, Army graduations with upwards of 1,000 cadets and their famous “hat toss”, and all sorts of other assignments on all things ARMY. Ironically, I’d also worked at USMA for the NY Daily News to photograph the Superintendent at the time in front of this very statue (below). A simple search here on the blog of my work at the academy is some of the work I am most proud of in my career. Returning to West Point on assignment for a new / old client, The New York Daily News was kind of special too. It was if I was working among friends… ~cg. 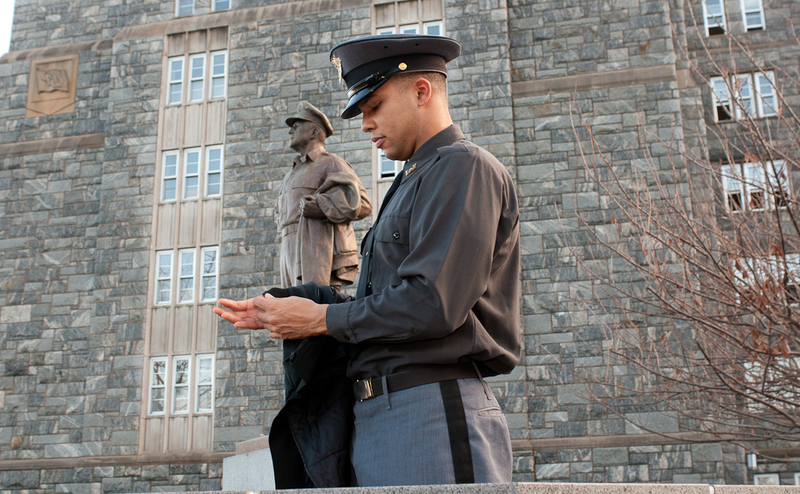 Army cadet Dion Hart pauses in front of the General Douglas MacArthur statue and MacArthur Barracks at the United States Military Academy in West Point, NY on Monday, November 24, 2014. Hart, 22, of Phoenix, AZ, is a senior on the Army swim team who was born to a 14-year-old mother and endured every possible hardship, including surviving homelessness, living in crack houses, and spending most of his life on welfare and food stamps. © Chet Gordon for New York Daily News. This entry was posted on Wednesday, November 26th, 2014 at 8:56 AM. It is filed under Assignments: and tagged with army, location lighting, pocket-wizard, sports, strobist, usma, west point. You can follow any responses to this entry through the RSS 2.0 feed.